John Deere unveiled a nursery fork attachment for skid-steers and compact track loaders. The nursery fork is the latest addition to the Worksite Pro attachments lineup and is optimized to work with select John Deere E- and D-Series skid-steers, compact track loaders (CTLs) and most competitive models, the company said. The nursery fork features a 3,000-lb. carrying capacity, a 54-in. fork opening, a 6-in. tread plate and an optional pressure-control kit that limits the arm-closing pressure. This attachment also can transport and position up to 44-in. balled or container trees and shrubs, along with rocks and light boulders. With the universal, self-cleaning Quik-Tatch easy attachment system, all John Deere skid-steers and CTLs can add and remove the nursery fork. 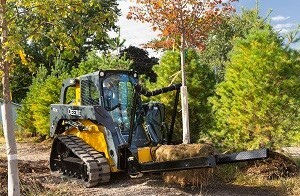 The new attachment is also backed by John Deere parts, service and warranty coverage.